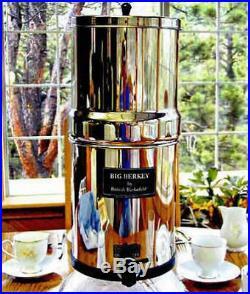 Premium Big Berkey Water Filter System with 2 9 White Ceramic Filters British Berkfeld. 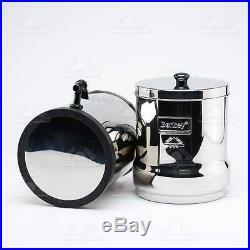 THIS LISTING IS ONLY FOR BIG BERKEY W/ 2 9 CERAMIC (DOES NOT INCLUDE 2 BLACK FILTER AND 2 PF-2 FILTER). The versatile Big Berkey system is the ideal system for use at home with small or medium sized families, travel, outdoor activities or during unexpected emergencies. This powerful system filters both treated water and untreated raw water from such sources as remote lakes, streams, stagnant ponds and water supplies in foreign countries, where regulations may be substandard at best. Perfect for outdoor activities and a must in hostile environments where electricity, water pressure or treated water may not be available. The Big Berkey system removes pathogenic bacteria, cysts and parasites and reduces harmful chemicals such as herbicides, pesticides, and VOCs without removing the beneficial minerals your body needs. Constructed of highly polished 304 stainless steel, the system comes complete with two 9 ceramic elements. This system has a storage capacity of about 2.25 gallons (8.5 liters) and when in use it stands 19.25″ in height with a diameter of 8.5″. The upper chamber nests within the lower chamber for transport and stands only 13 in height. The system will filter up to 15 Gallons per day. 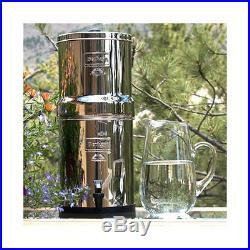 Big Berkey stainless steel water filter system. 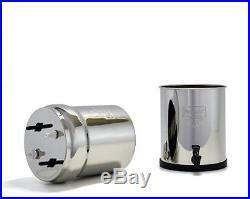 2 Ceramic Super Sterasyl Filters. Can filter up to 15 gallons per day. Self-sterilizing and re-cleanable filters. 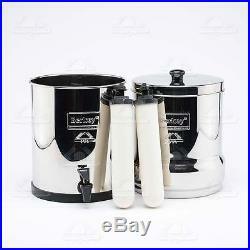 Were you looking for Berkey with 2 Black and 2Pf-2 Filters? This system is widely used by customers. 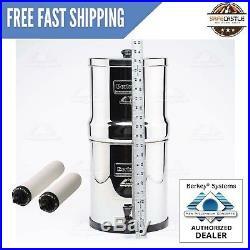 Berkey Stainless Steel System inludes 2 Black Berkey Purifiers, 2 White Fluoride Berkey Filters. Berkey is ideal for environmentally conscious families who demand the very best healthy water for their loved ones. 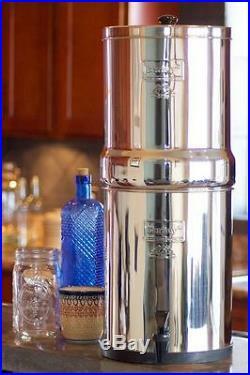 Our most popular Big Berkey holds 2 gallons of pure water and is 19.25 inches tall by 8.5 inches wide. Why Black Filters: This high-quality replacement filter vastly improves other brands’ housings’ ability to remove unwanted water contaminants. Each Berkey filter element has a life of 3,000 gallons: That’s an incredible 6,000 gallons for a two-filter system (less than 2 cents per gallon of water) Why PF-2 Filters: The Berkey water filter fluoride reduction elements work by adding the ability to remove the contaminants listed below. When threaded directly onto the Black Berkey® purification elements the fluoride reduction element is an effective way to take control of targeted harmful contaminants in your drinking water. These fluoride water filters work as a post filter to the Black Berkey and is compatible with all Berkey water filter systems. View more great items. 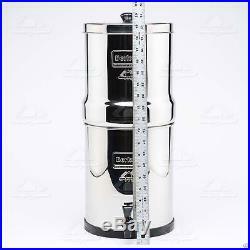 The item “New Big Berkey Water Filter System w 2 9 White Ceramic British Berkefeld Filter” is in sale since Thursday, March 23, 2017. This item is in the category “Home & Garden\Kitchen, Dining & Bar\Small Kitchen Appliances\Water Purification\Water Filters”. The seller is “safecastle_emergency” and is located in Redondo Beach, California. This item can be shipped to United States, Canada, United Kingdom, Denmark, Romania, Slovakia, Bulgaria, Czech republic, Finland, Hungary, Latvia, Lithuania, Malta, Estonia, Australia, Greece, Portugal, Cyprus, Slovenia, Japan, China, Sweden, South Korea, Indonesia, Taiwan, South africa, Thailand, Belgium, France, Hong Kong, Ireland, Netherlands, Poland, Spain, Italy, Germany, Austria, Bahamas, Israel, Mexico, New Zealand, Philippines, Singapore, Switzerland, Norway, Saudi arabia, Ukraine, United arab emirates, Qatar, Kuwait, Bahrain, Croatia, Malaysia, Brazil, Chile, Colombia, Costa rica, Dominican republic, Panama, Trinidad and tobago, Guatemala, El salvador, Honduras, Jamaica, Viet nam, Uruguay.